Hello Doodlebug fans! 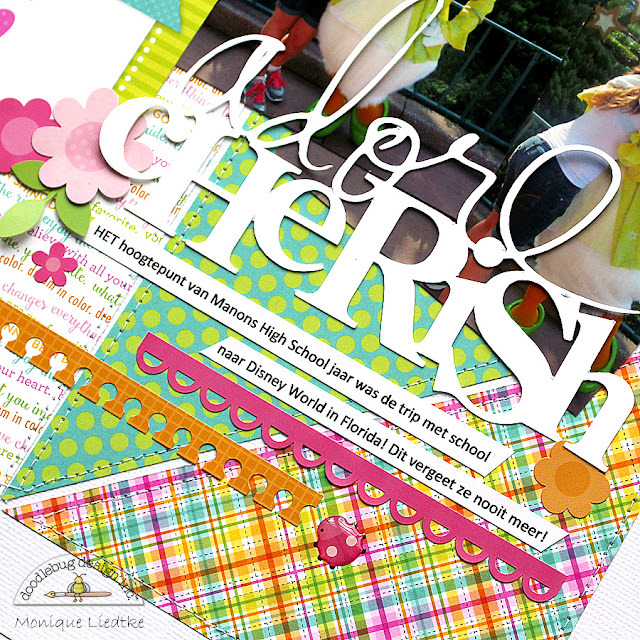 Today I'm sharing a Disney layout using Doodlebug's Spring Garden collection. Last April, when my daughter was in Louisiana on an Exchange year she had a school trip to Disney World, which was a dream come true. As she wanted me to scrap lots of her memories she came home with hundreds of photos, like these two of her and Daisy. I was so happy the colors of the photos matched this collection to a tee! As I couldn't decide which papers to use, I chose a design for which I needed lots of different papers and came up with these triangles. For the title I used my Silhouette Cameo and beneath it I adhered two strips of journaling, followed by two strips of fancy frills and an adorable little ladybug. How I love this collection! Hope you do too! Thank you so much for stopping by Doodlebug's blog to take a peek at my project. This is fabulous Monique! Love the stitching!